Give those little witches a cauldron they can cackle over! 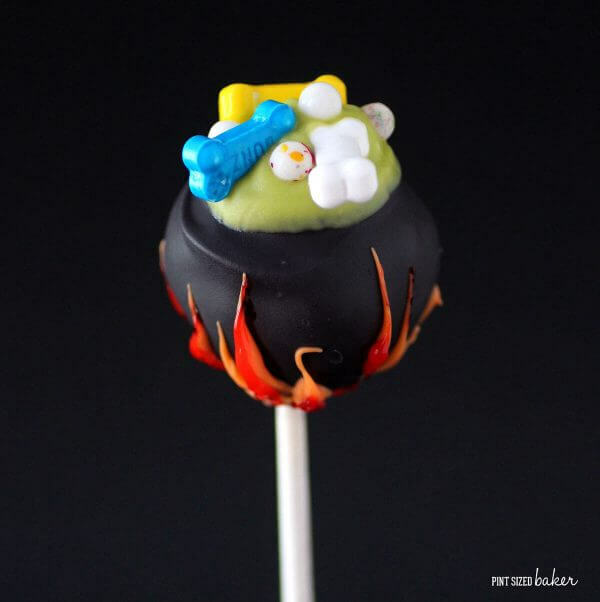 These fun Cauldron Cake Pops will be the hit of your Halloween Party. Halloween is upon us! Are you ready? 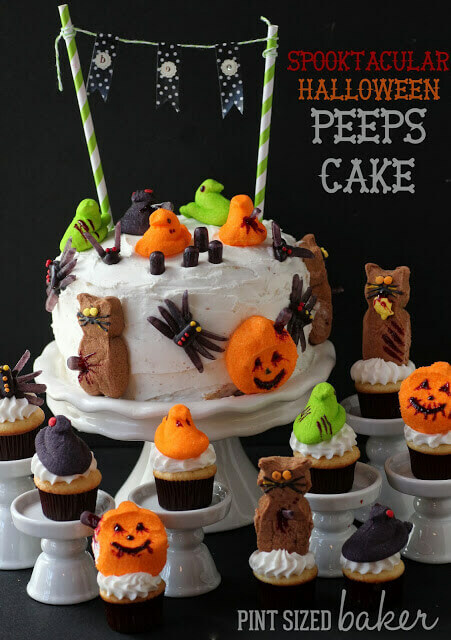 Your little witches and ghouls are expecting some spooky treats at their Halloween Party. 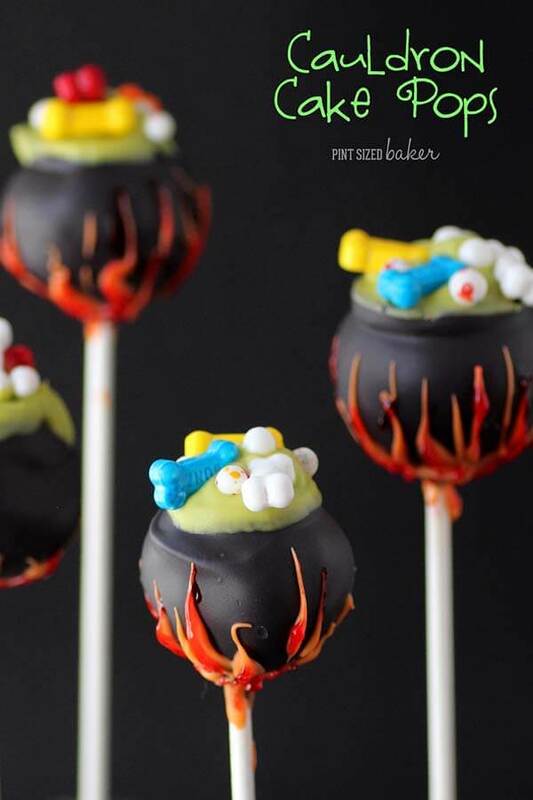 These Cauldron Cake Pops are going to wow all the goblins in attendance. I’ll show you just how easy it is to make them for your party! 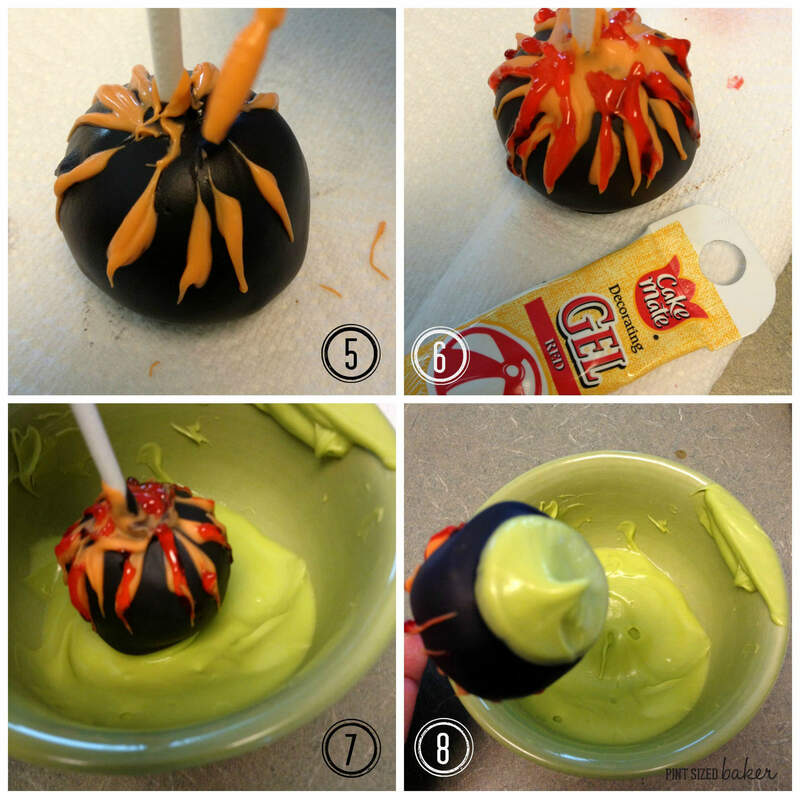 These fun cake pops are pretty easy to make and you can use the same technique if you are making the Goldfish Bowl Cake Pops. You can pick up all the supplies at your local craft store or Wal-Mart. I’d suggest getting the Wilton bag of vibrant green disks because they will be easier to work with rather than coloring your own candy melts. 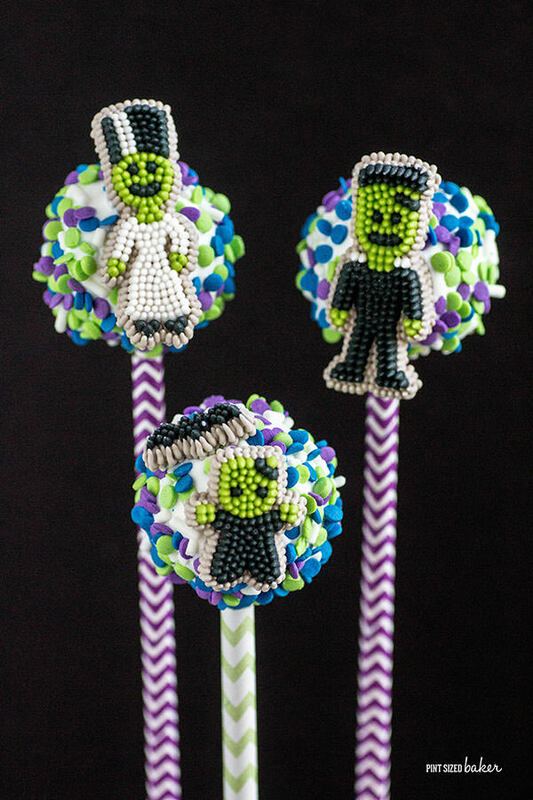 Want to add some fun Witch themed desserts to these Cauldron Cake Pops? Make some Witch’s Brew complete with eyeballs to drink, some Halloween Witch Hats to snack on and after trick-or-treating, warm them up with some Melting Witches Hot Chocolate. Cut cake into quarters and place 1/4 into mixing bowl. Add 2 Tablespoons of the frosting and mix with a paddle attachment until smooth. There should be no cake lumps and there should be no sign of the frosting. The batter should be that of a play-doh consistency. Add more cake if there is visible frosting. Add more frosting if the batter appears dry. Measure 1 tablespoon of the cake pop batter and place it on a cookie sheet lined with wax paper. You should get 10 – 12 cake balls from a 1/4 of a cake. Roll the batter between clean, dry hands until smooth. Do not compress the batter. Place the rolled cake balls into the fridge for 30 minutes depending on how soft your cake balls were. Do not place them into the freezer to speed things along. Getting the cake pops too cold will lead to cracked cake pops. Melt candy melts in a deep glass bowl or ceramic mug according to directions. You will need all of the black candy and only 1/4 of the green and orange colors. *TIP – place it in the microwave at full power for 1 minute. Stir and then place back in the microwave for 30 second intervals at 70% power. Do not overheat the candy coating. It will get thicker and thicker the hotter it gets. Remove cake balls from the fridge and lay out one green candy melt disk per cake ball. Dip 1/4 inch of the stick into the black candy and then insert it half way into the cake ball. Complete all the cake pops. 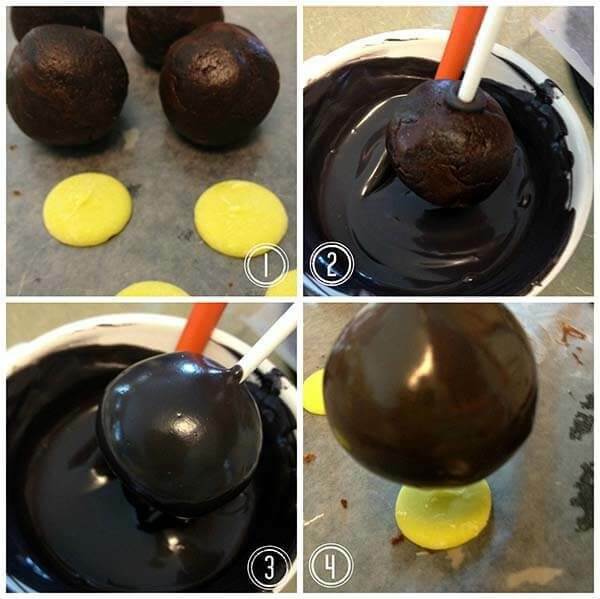 Completely dip the cake pop into the black candy and tap off the excess. Place the cake pop down onto the green candy disk. Complete all cake pops. Using toothpick, paint on the orange candy around the lollipop stick. It’s ok to be messy. This is the fire at the base of the cauldron. Complete all pops. Add some Cake Mate Decorators Red Gel to the orange melts to give it a red, glowing effect. Carefully dip the green disk part of the cake pop into melted green candy. 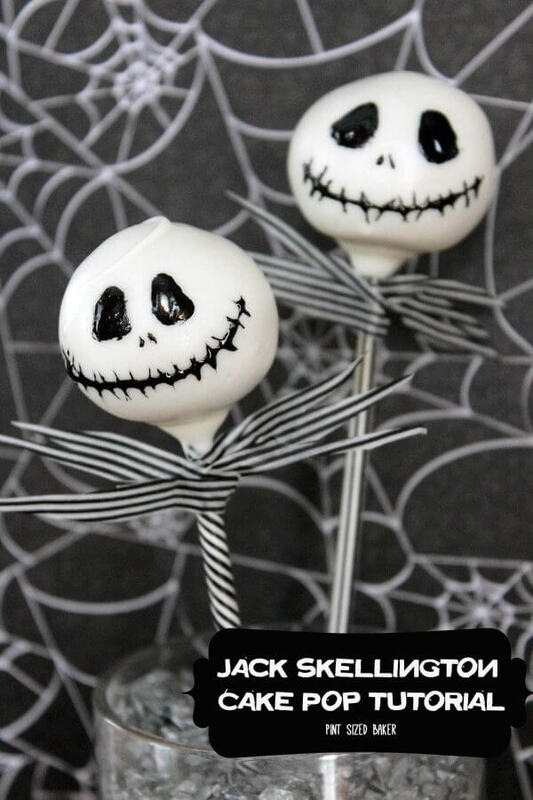 Add the bonz and eyeballs to the wet candy and stand up in a cup or styrofoam to dry.